Are you ready for the Apocalypse? The Moloch have made their decision - New York must be razed to the ground, breaking the people's defense lines and ending the resistance - permanently! Now, a convoy of steel-death swarms to the east, threatening to destroy everything in its path! Unless the Outpost soldiers can stop the march of Moloch, humanity is lost! 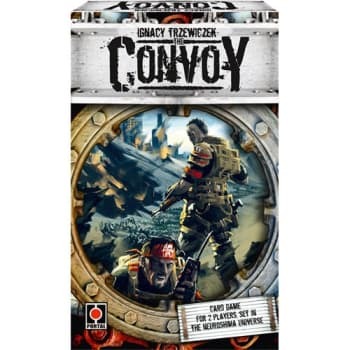 Set in the post-apocalyptic world of Neuroshima, Convoy is an asymmetric, two-player game where one player controls the convoy of powerful robots moving towards New York to turn it to ashes, and the opposing player commands the Outpost troops, seeking to slow down the convoy - and destroy it!